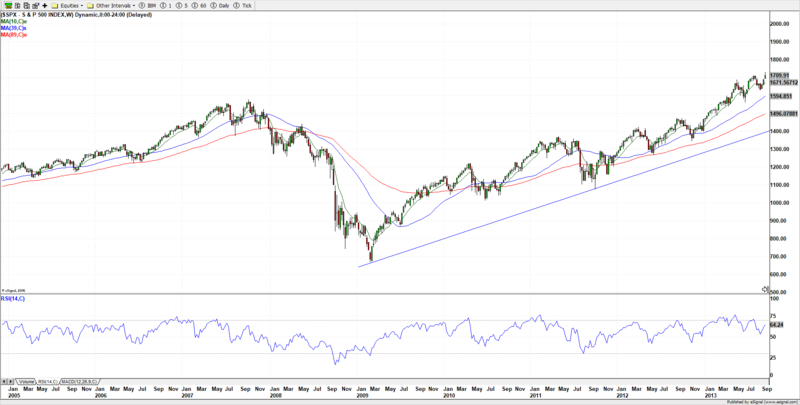 How The S&P 500 Fared During The Last Shutdown Talks? The last U.S. government shutdown happened in October 2013. Then the federal government shutdown lasted for sixteen days from October 1st to October 17th. Here is the time line for it. The U.S. House of Representative was controlled by Republicans, the Senate by Democrats and Obama was president. The point of contention was Affordable Care Act (ACA) or the Obamacare. The GOP wanted to link defunding it to the bill authorizing the funding to keep the government open. President Obama had said that he would veto any bill that defunds ACA. The GOP was against the ACA and wanted to repeal it. The talks to defund it picked up steam in August 2013, when the time came to pass a continuing resolution for the interim authorization of appropriations for fiscal year 2014. S&P 500 had been rising since 2009 and after the debt-ceiling scare in 2011. In April 2013, it crossed above the previous high water mark of 2007 (see Fig. 1). It made all time high, till then, of 1729.86 on September 19, 2013. By October 9, it had declined to 1646.47, a -4.8% drop. Looking at the price action of S&P 500, it is clear that the government shutdown talks were affecting its movement. On Thursday September 19, the S&P 500 made an all time high following a large gain, +1.2%, on Wednesday but it closed the day marginally down, driven by the talks of the imminent bill. On Friday September 20, the House Republicans passed a legislation to defund the Obamacare while keeping the government open through Dec. 15. The S&P 500 declined by -12.43 or -0.7% (see Fig 2). From then, the index declined for five out next six trading days before the shutdown. On Friday September 27, the Senate Democrats passed a version of bill that stripped the language to defund ACA from the House bill. The S&P 500 dropped further -0.4% after gaining +0.3% a day before. On Sunday September 29, the House passed another spending bill but again tied it to delaying the implementation of ACA and repealing medical device tax. The index fell another -0.6% on Monday, the next trading day. On the day of the start of shutdown, October 1, the S&P 500 gained +0.8%, but it still had not made the bottom. Following the shutdown, the talks for restarting the government began. After that, the index rose when the signs of compromise emerged and declined when the talks stalled. The rumors of breakthrough came on October 9, which marked the final decline in this saga. It was a reversal day with the S&P 500 making a doji candle with +0.1% gain over previous day. On October 10, the Speaker of the House, John Boehner, proposed a six-week extension of the debt limit if Obama negotiates over spending cuts. From then till the signing of the compromised bill on October 17, the S&P 500 advanced for four out of five trading days. Form October 9, the index advanced for 13 out of next 15 trading days. It made another all time high, at the time, on October 17, the day president signed the bill to keep the government open. Though the power dynamics are different this time as GOP controls the House, the Senate and the White House, it is very likely that the government shutdown talk will have an impact on S&P 500 in the coming days. The index is also quite extended and perhaps ripe for some profit taking. However, any decline will be shallow and would not last very long unless the shutdown lasts for a prolonged period, which would affect the credit rating of the U.S. and that would affect most asset classes negatively. 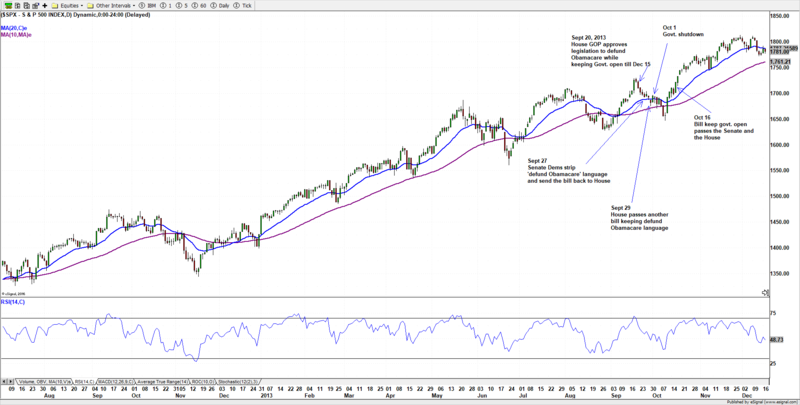 January 19, 2018 in Market Commentary.